4.6 (Based on 17 Reviews) 100% of reviewers recommended this product. 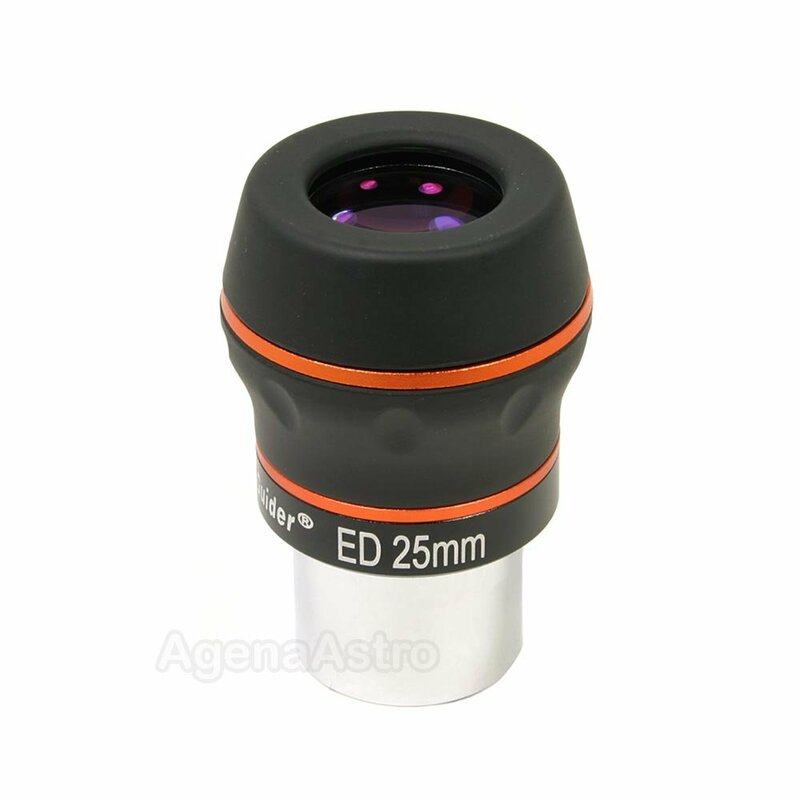 My four-star rating for the 25mm Agena Starguider Dual ED eyepiece is a compromise due to very different performance in fast and slow telescopes. The eyepiece shows a clear and sharp image in my 114mm f/7.9 newtonian reflector. The 60° field of view is pleasing and the eye relief is comfortable. It's a five-star eyepiece in a slow scope. Unfortunately, I found the eyepiece unsuitable for my 130mm f/5 newtonian. Curvature of field causes stars near the edge to be badly out of focus. I'd rate it only a two-to-three-star eyepiece in a fast scope. The eyepiece shows a clear and sharp image in my 144mm f/7.9 newtonian reflector. The 60° field of view is pleasing and the eye relief is comfortable. It's a five-star eyepiece in a fast scope. I purchased this and the 15mm version after reading in a couple of places that they were a great value. They seem to be just that. I coupled them with a 2x Televue barlow. I currently have an inexpensive 5" Dobson telescope. I would not say they are overkill. In fact, they add a lot of quality to the viewing experience. They should continue to serve me well as I move to a larger and more expensive scope in the future. I have a Nexstar 102 SLT with a 6.47 focal ratio and this series of eyepieces are much better than the ones that came with the scope. I use the 25mm for finding objects or sometimes just for scanning different areas of the sky. Clear views and decent field of view. I did not like using my 25mm Sirius Plossl eyepiece because of its small perfect focus point. With this eyepiece I do not have that problem and it is very comfortable to see through it, besides that it looks better. 5.0 Nice heft. Great grip. No gripes. The Agena 25mm ED is a keeper for me. Everything about it from the fit and finish to the FOV are perfect. The free bolt bottle is just the icing on this tasty bit of cake with its clean, crisp images across the entire field. Would i recommend the eyepiece to a friend? Without hesitation. Review by Troy of York, SC. I have the whole set of Dual ED eyepieces and find them more comfortable and easier to use than any other I've tried. Those others include ES 82 degree and Celestron Luminos eyepieces, glass costing 2-3x more than these. Dual EDs do have a narrower AFOV than the ES and Celestron, but what you get is a whole lot more accessible. The whole field of view is visible without having to move your head around or adjusting the height of the eyecup. I have used them in slow and fast telescopes. In the fast ones edge of field distortions are significant, but not much more than any other eyepiece. On the slow scopes distortions are not an issue. What compelled me to write his review is how well it works in my Coronado PST. The PST is a difficult telescope to use because of its narrow field stop. All eyepiece require precise eye positioning to get a good view. When you get the position correct, the view is worth every penny. The 25mm Dual ED's twist-up eyecup puts your eye in exactly the right position every time. It gives the most wiggle room of any eyepiece I've tried. The sun is the right size to keep it the field long enough for your eye to adjust the the H-alpha. It is the go-to eyepiece for this scope. It's the only eyepiece we ever use for public outreach with the PST. These are fine eyepieces, particularly when used with long focal length telescopes. Some have complained about the 25mm Starguider's peripheral astigmatism when used with fast, short focal length ED refractors, but I haven't used it in that application. That said, this is not a Televue Nagler or Ethos, but it doesn't cost like either of those EPs either. For the SCT or MCT user, the Starguiders are a great value. Solid, good eye relief, well constructed. Review by maddman of Richmond VA. This eye piece is my go-to. Every chance I get to take my scope out this is the eye piece I always start with. Awesome field of view and crystal clear optics. I think I have gotten muscle memory because I can set my focus and set this eye piece in and I am within .5 MM of true focus. It has been cold some nights and the Agena Starguider eye piece is by far the easiest to grab. You don't think about these things in the summer but wow does it come into play on cold nights. Review by Fly2High of Long Island, NY. I truly loved this eyepiece. I thought it was definitely a step up from the Zhumell EP that came with my 8" f/5.9 DOB. I think it produced a very bright image with very good contrast. I think at least 70 or maybe 80% of the field produced pinpoint stars and then one could notice some small amount of flaring. They were very lightweight and easy to turn up the cup. The only issue that caused me to return it was the fact that a DGM filter would not screw it. The threads on my 25 mm were cut too wide such that I could slip the filter into the bottom without a single turn. I understand that every manufacturer has tolerances and obviously I got a EP and filter from opposite sides of the spectrum. Not wishing to have to find a solution, I opted to return it and purchase a Meade 5K HD-60 instead. For the one Meade (6.5mm) I had purchased, it too looked very good but much heavier. This did not exhibit this problem and was optically very god as well. Agena did offer to measure a sample or two from stock for comparison and to exchange the EP but without the certainty that a narrower thread would be found, decided to return it instead. I do feel Agena went out of their way to help with this issue and I will be happy to purchase from them again for the Meade as well as in the future. Excellent quality eyepiece. Excellent Agena Astro service. Review by starmike of Jacksonville, FL. Since I purchased the 25mm, I have also added the 5, 8, 15mm units. I think this is one of the best kept secrets. The eyepieces are excellent. Pinpoint stars all the way to the edge and at 60 degree AFOV. They blow away my other eyepieces including my ES eyepieces. You won't be disappointed in these. If people tried these and word got out that you could get them at this price, Agena could not keep them in stock. Great job Agena! Review by Kevin25671 of Massachusetts. This is an excellent EP for the money. The 25mm gives me the same TFOV as my 32mm Plossl but at a higher magnification. I bought this for use with my Celestron 6SE. Review by Wagner Trindade of Sao Paulo, Brazil. Good wide field eyepiece with a reasonable price. Recommend it for DSO or as a finder eyepiece. Review by Green Zebra Observatory of North Central Maryland. It is being used in a flip-mirror system to assist in centering astonomical targets for video and astrophotography. Perfect for this application.